Richy Pitch gives us Football Jama! Percussion – Michael Kweku Owusu and the Gye Nyame Institute (Art Centre Accra). This track was inspired while Richy was living in Ghana for 2 years. 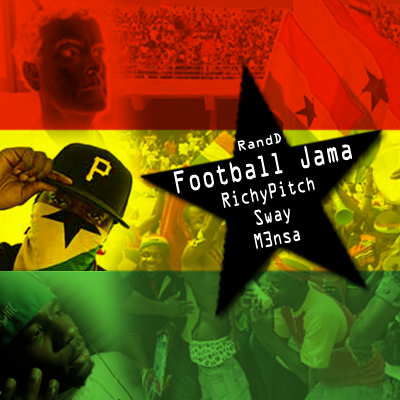 After going to the brilliant CAN 2008 football tournament, Accra, Ghana Richy was inspired to make a song which evoked some of the Jama music you’d hear at the African Nations football tournament. Sway and M3NSA complimented the song with their excellent vocals, Sway plays the part of Captain of the Blackstars and M3NSA is the chief supporter of the Ghana National Team. The trumpets are from Prosper who actually plays trumpet at Ghana football games. The percussion was from Michael Kweku Owusu, Kwesi and other players from the Gye Nyame Instititute @ the Art Centre Accra Ghana. The horns and crowd sounds were recorded off Richy’s camera at the games. Richy completed the production in the UK. Look out for the LP ‘Ye Fre Mi Richy Pitch’ coming this summer! This entry was posted in download, Hip-Hop, Music and tagged Football, Ghana, Ghana Black Stars, Jama, M3nsa, Michael Kweku Owusu, Percussion, Prosper, Richy Pitch, Sway, World Cup 2010. Bookmark the permalink.